Woodbrook House is a fine house in the shadow of the Blackstairs Mountains, west of Enniscorthy. It dates from the 1770s but was damaged in the 1798 rebellion and substantially rebuilt. The result is a spacious, warm house with an exceptionally large drawing room–much used by guests–and a dramatic ‘flying’ spiral staircase. The home cooked food is excellent (using largely organic and local produce) and the atmosphere relaxed and welcoming since the owners, Giles and Alexandra FitzHerbert, are experienced hosts and enjoy entertaining. Woodbrook makes a good base for the Carlow Eigse Festival in June and the Wexford Festival Opera in late October, and for visiting this largely unspoilt region. 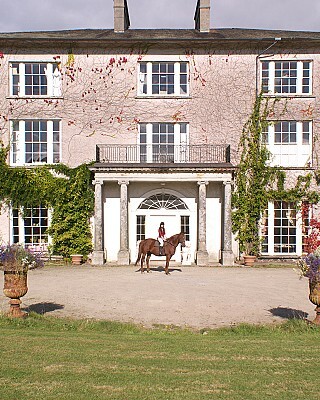 Woodbrook House sits in the middle of its demesne with the Blackstairs Mountains as a backdrop. A visitor from England writing in 1920 remembered it as ‘a large, square house, very comfortable, very solid, very unpretentious, with an undulating park, covered with fine old trees and beside it rise up the mountains as if in protection’. The FitzHerberts have lived at Woodbrook since 1998, restoring both house and grounds and adding bathrooms and central heating. Giles is a former ambassador and Alexandra is of Anglo-Italian-Irish-Chilean extraction, so they are both accustomed to entertaining guests from all over the world. Woodbrook was the venue in 2007 and 2008 for the Irish Green Gathering and is also the site of Ireland’s first natural burial ground inaugurated in 2011. The house is open for guests in principle from Easter to September and during the Wexford Opera Festival at the end of October, but not during the summer English courses in July. Stays also can be arranged on an ad hoc basis at other times. Calendar / Open Easter to 31st October.